Who doesn't love something for free? 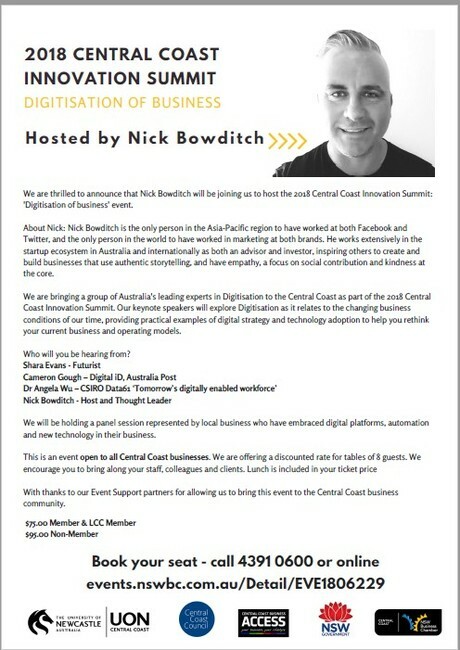 Thanks to our partners at NSW Business Chamber Central Coast we have two tickets to give away to next week's Innovation Summit. The summit has secured an outstanding selection of world class presenters and is shaping up to be one of the key events for 2018. 1. Buy one ticket to the summit HERE! 2. Then send an email to info@GECChamber.com.au telling us why you think innovation in business is important. The best two submissions will be selected and contacted by 12.00 noon Wednesday next week and each one will get an extra ticket FREE! Allowing you to bring along a friend, colleague or business associate to be a part of this fantastic summit.